I love anything that I can decorate my home with that represents the state I live in. 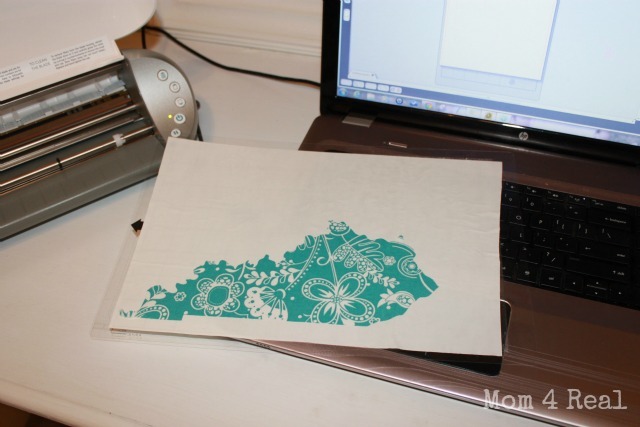 I have stenciled a pillow before with the silhouette of Kentucky on it, but now thanks to Silhouette’s fabric interfacing and fabric blade, I can make pillows whenever I please with fabric! You don’t know how much this means to me…I love making my own pillows! I decided to start with a silhouette of Kentucky just to see how it would work, and it turned out perfectly! Our little turquoise desk now has it’s own little pillow! To make your own, you will need fabric, heat transfer fabric interfacing, and a Silhouette with a fabric blade. You will need to cut your fabric and interfacing to the size you need depending on how large your image will be. 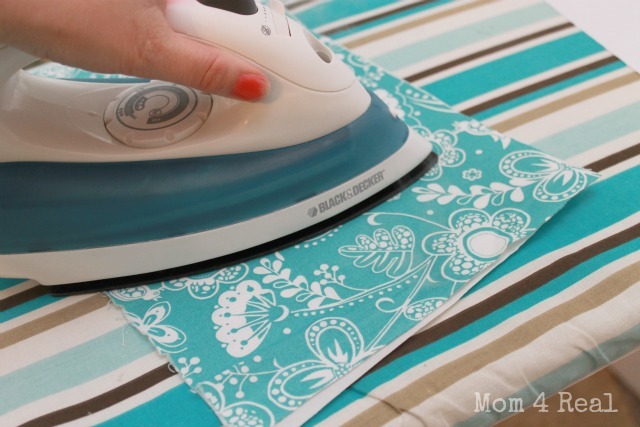 Iron the fabric onto the tacky side of the interfacing. 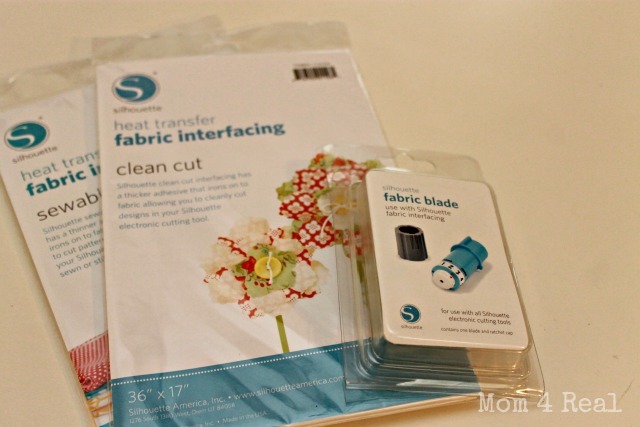 Smooth your interfacing with fabric onto your Silhouette mat and insert it into the machine. Choose your image and program your Silhouette to do the cutting. 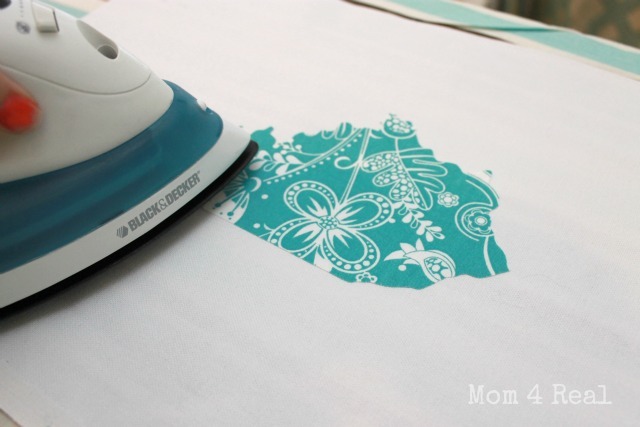 Once your image is cut, iron it on to your pillow fabric. Now, sew a pillow in your preferred method, and you’ve got it! Now isn’t this the cutest little pillow you’ve ever seen? If you don’t prefer KY, just pretend it’s Georgia, or California, or heck, even Hawaii! Now to the even better part…you can buy these Silhouette Supplies along with a Silhouette in a bundle at a huge discount….ORRRRR…you could win your very own Silhouette Portrait!!! 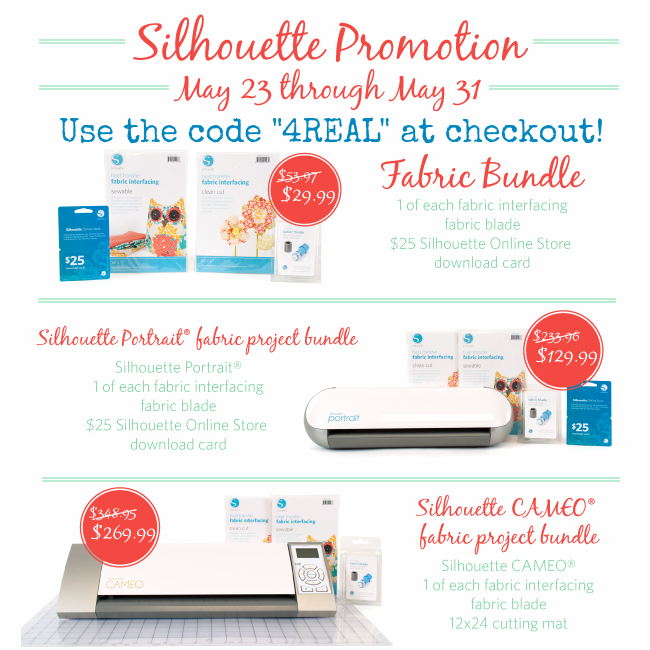 You can shop using this link right here: www.silhouetteamerica.com/fabric and remember to enter code 4REAL at checkout! Now onto the Giveaway! ONE lucky person will win a Silhouette Portrait of their very own! Woo Hoo! Please use the rafflecopter widget below to enter for a chance to win! Giveaway valued at $269.99 and is open to US residents only. By entering this giveaway you are agreeing to my official giveaway rules. There are so many thing I would use it for I don’t know where to begin; pillows, stencils, cards and the list goes on! I would make either a bag for my boys library books or a cool t-shirt! I would love to try the print and cut technique! I just moved home from college, so I’ve been updating my room from a high schooler’s room to a post-college graduate’s room. I would make a pillow that matches my new, more sophisticated room! Such a cute project, Jessica. Of course, I think it would be even cuter as North Carolina! I’ve cut fabric with my regular Silhouette blade but would love to try the special fabric blade. Beautiful pillow! I love the fabric you chose for the state! I would love to make vinyl labels for everything I have organized! Oh my goodness, I would make everything!! I’ve been pinning a LOT of those wooden signs with songs and verses on them, and I would love to be able to make some as a gift!!! Here’s hoping! I would love to make canvas prints using inspirational words/Bible Scripture. I also have a daughter getting married later this year and it would be fun to make some wedding decor with a Silhouette! I’d love to make some super cute pillows and also some stencils! I’d like to try some of the glass etching to make labels for my glass jars. I would make a New York wall art! I’d start with a vinyl monogram for our door! Then I’d try fabric for pillows, etc! Thanks for the opportunity to enter! i have been wanting to make some prettier cards than i am able to do by hand. but i really want something to help me cut fabric pieces as i would like to try my hand at quilting. There is so much I would do! Cards, t-shirts, pillows, etc…your only limitation is yourself! Oh my gosh. Ever since one of my dearest friends got a Silhouette and I started seeing the stuff she could make with it, I’ve been drooling over getting one. (Someday when I win the lottery, I’m going to have a HUGE crafting budget!) This would make my year to win this thing! I would make wall art – just to start with! Oh my Gosh I’d make all kinds of things..pillows, shirts, wall art… the list goes on and on! I can think of a million and one things I could make with one of these! Would love to win it! I am very new to this, but thanks for the awesome giveaway. Would love to make anything with a Texas stencil on it, a pillow, t-shirt, the list can go on and on! Wall Art! Would love to play with the vinyls and decorate my home! I’d finally the birthday ‘sign’ that’s been on my to-do list for over a year! I would make all kinds of stuff!!!! I need some new throw pillows for the couch, personalized gifts, wall art…I could go on and on!!! I love anything with a state on it also. My in-laws have lived in 4 states and I’ve given them artwork that represents 2 of the 4 states. Working on the last two now. I think a pillow would be a lovely change of pace. I’d use it for my son’s 2nd birthday decor! Thanks girl!! This would be a crafting dream come true if I were to win this AWESOME die cutting machine. Thanks for the wonderful opportunity. I would make cupcake wraps for a wedding cupcake tower I am making! i do many, many signs (all different styles) and the silhouette would come in so handy for me to create the wording! i’ve tried many times to win one! hoping this is the winning contest for me!!! thank you for hosting this! i love your blog! receive a lot of great ideas from you! 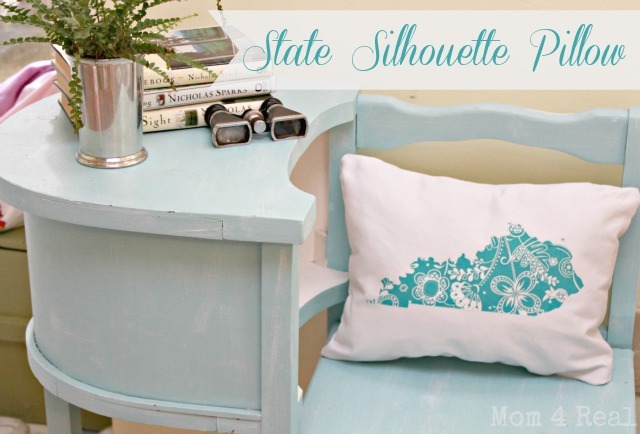 I love the idea of a state pillow and I’ve got the perfect orange and white fabric fot TN! I have been wanting a Silhouette, but since I own a Cricut I didn’t feel I could justify buying a Silhouette. I love that you can cut fabric. This would come in vary handy. I would probably make coats for my dogs! I would love to make some vinyl wall art. Love that it cuts fabric! I would cut some stuff for quilts. I would start with pallet art and go on from there! I think I would make something for my baby’s room, maybe start out with a blanket or pillow using his name. I would love to make so MANY things! Cards, gift tags, vinyl creations! The possibilities are endless!! If I won the Silhouette I would be SOOO happy! I have been wanting one forever! I would make a lot of projects and I love the pillow idea that you have posted. I would do a growth chart, and probably some pillows like yours! I would first make something to put up on my wall! Maybe like a quote or something! What wouldn’t I make??? Definitely start with pillows though! Thanks for the chance! I would make some tshirts for the kids. Oh, how I would LOVE to have a Silhouette. All sorts of onesies and t-shirts for my little guy! My kids need some fun shirts. I’d love to make them some! I would make several things, but mostly want to use it to do reverse stenciling. Oh my! I think I would be making anything and everything possible. I’d love to try to cut fabric to make some tshirts for my brother-in-law’s soon to be arriving baby. I would use it for gifts and home décor, like another poster said the list could go on and on! I have a Cricut but desperately need a Cameo. I want to use it for fabric and rhinestones. Thanks for the chance to win such a cool machine. I’d love to make cute holiday shirts for my kids, and I want to experiment with vinyl!! I would make a bunch a crafts for the kids and decor around the home! Labels for the containers in my pantry and spice drawer! I’d make some vinyl wall art. OOHHH how exciting! Thank you for the opportunity of perhaps winning this little beauty!! This is awesome.. So many ideas come to mind right now. Oh gracious! How do I choose just ONE thing I would like to make? I guess if I HAD to choose, it would be a piece of subway art for my family room. I would make a ton of things! Die cuts, fabric cuts. glass etching. I think I would do some applique t-shirts for my girls. That would be cute! Thank you so much for the opportunity to win!!! I have been drooling and dreaming about a silhouette for awhile now!!! I would love to make a flower tshirt for my daughter. Wow! Pillows – just like the one you may. Fir starters, that is! I would make alot of appliqued shirts and stuff for my kids! I don’t know what I would use it for — but I bet my wife would love it! Hope I win! I’d sooo love to win to make tshirts for my boys. Thanks for the giveaway, SOOO many cool crafts i’ve pinned that I’d love to use this for! I’d make tees for my two girls! I would make appliques for t shirts! I love the pillow idea! The possibilities are endless! I would make a stencil! I would love to make some vinyl wall art and some applique tshirts. Hmmm, so many things I would want to make! I love that there is a “fabric” blade for the Sihouette. The electronic cutting machine I have now doesn’t always cut my fabric very well and I am limited to the cartridges sold for it! So many projects, so little time. Not sure what I would do first. I would use it to embellish some handmade bags. I think I would like to make some jewelry or some fabric enhanced greeting cards. Thanks. decorations for the nursery – I’m having a girl! Even if they fall off, I’m going cross my fingers until this giveaway ends! P.S. I’d make cookie stencils & have matching pillows! T shirts, pillow cases, everything! I would make a pillow in honor of our last state (GA) and current state (PA). Thanks for the chance to win! I would use the Cameo for wall art, pillows, subway art etc. Everyone needs a Silhouette! The first things I would like to make are some tshirts. I would love to make t-shirt transfers! I’d love to make really cute purses for my kids with this! I would use mine to create my own label, one the kids will see as Hands off, That’s mums, and she’ll find out if we touch it. I’d make some room decor for my boys! I want to make a HUGE canvas with the 25 last words each family member wrote to each other. There are so many things I would love to make. I think I would make anything with fabric..
I’d make some subway art. I would love to make better cards with this…thanks so much for the opportunity to win! I would make so many things I can not even list!! This has been on my wishlist for a very long time. I think first project would be some invitations for a friend’s little girls’ party. I would make vinyl numbers to that I could redo a mid-modern dresser with numbered drawers! There are soooo many fun projects I would love to try with a new Silhouette!! The first thing I would cut would be vinyl to make some super cute canisters for my daughters kitchen in her new apartment. I would customize some awesome tote bags for our guests for our destination wedding! I have so many things on my “If I only had a Silhouette” list….but I think I would start with 4th of July shirts for the family. I would make t-shirts with my daughter this summer. Would love to win to decorate my scrapbook journal! I really want to cut out some fabric diver silhouettes to make a custom t-shirt for my husband. Thanks so much for sharing this great giveaway – I REALLY want to win! Sometimes somethings become so essential that it takes time to hit you. Silhouette is one such product, it could simplify my life as a crafter. A quite book and baby’s playroom decor are top of my to do list. Oh, I would love one of these machines! I’d probably start with adorning T-shirts for the grandgirls, and then, who knows where creativity will lead! I would love to make some shirts for my boys. i was thinking wall decals now i’m thinking pillows!! I really would like to dump my Cricut Mini and replace it with Silhouette so bad! What a great machine. I knew it was just a matter of time before it started cutting fabric! I’d make some personalized totes for the summer. My girls would love that! I’d start with some vinyl lettering, then do more wall art and iron on designs and shirts, pillows, tags,cards. …..etc,etc,etc. ;) thanks for the giveaway! I would love to do some wall art! A monster onesie and decorations for my son’s 1st birthday, pillows, art, signs…you name it, I’ll make it!!! I’m impressed by how cleanly all the details are cut. What a cute project! I’ve wanted a Silhouette for so long, there are so many things I’d love to make. Banners, labels, wall art, pillows and wearable art, etc. What a very generous giveaway. Thanks for the chance to enter – I would use it to cut appliques for daughter’s shirts and I would love to try my hand at creating a stencil! I would make subway art with our first dance song on it! So many possibilities it’s hard to decide what my first project would be. I’d make a chore chart. I want to give this machine to my friend! I would love to make signs with my portrait! Wall art for my entry way. This is why I need a silhouette! I have some wall art I want to make using fabric!! I’d love to make some decorations for my classroom! I’m not sure what I would make, there are so many possibilities. Great giveaway. Thanks! I would definitely decorate my kiddos rooms with applique insanity! There are so many things that I would make if I won! I would make cards, banners, shirts, onesies, and so much more!!! I know it’s not part of the promo but I would love to do some vinyl wall art! I would make some appliques for my daughter’s shirts if I won a Silhouette. So many thing I could do with this machine…. I could have a pillow for every state we’ve lived in. What fun! If I won, I would make family “team” shirts so all of my boys would know how much we all support him when we are at tournaments or competitions. I would make appliques for my tennis t-shirts. I’d make some t-shirts and onesies as gifts. I would use it to make some monogrammed tote bags. 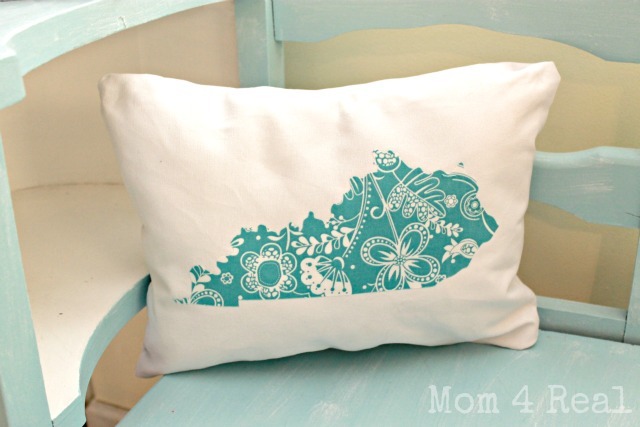 I would make some appliqued pillows for my family room. id use it for craft projects to make for gifts and to use up my fabric pieces stash! So many projects.. for sure some tie onesies for my baby. Would love to make something with the grandkids! I would love to use it to make custom tshirts for my nieces and nephews. I’d make all kinds of appliques for everything, thanks! I would love to make some vinyl wall decor! I would love this machine!!! i think the first thing i would make with it would be tote bags….i have so many ideas for these!! !